3 Comments Published by Jane on Sunday, February 21, 2010 at 4:25 PM. 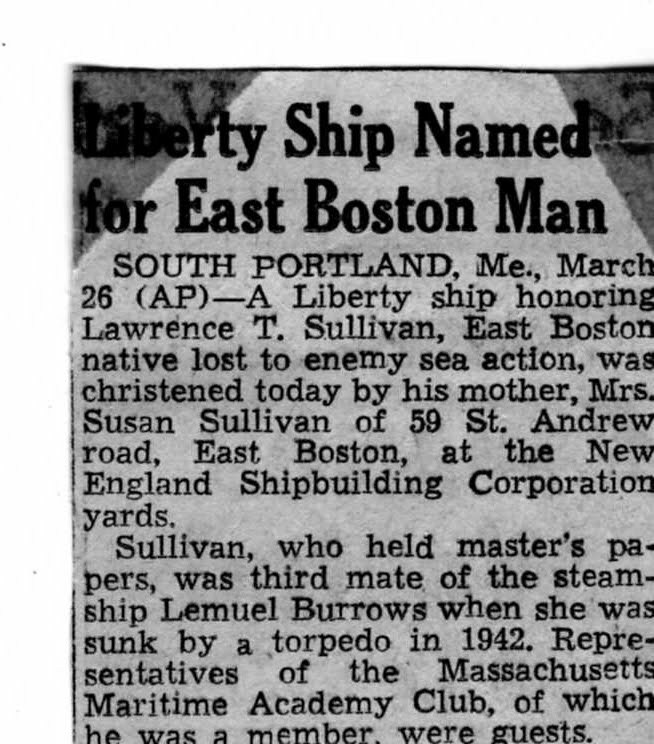 My Great-uncle Lawrence T. Sullivan was serving on a merchant marine vessel in 1942 when it was struck by a German U-boat and he was lost at sea. 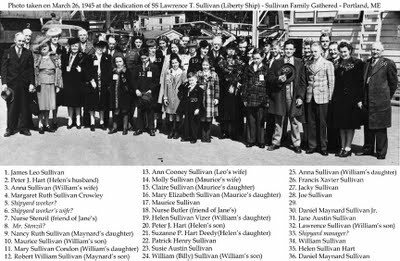 In 1945 a Liberty ship was dedicated in his honor. For the dedication his Mother, surviving 8 siblings and their families and friends gathered for the ceremony. The picture below (click to view larger) was taken at the shipyard and I have numbered the group (36 people) and with the help of various family members managed to put names next to most of the numbers. I am hoping someone visiting the blog might be able to help fill-in the missing names (or provide corrections if needed) and finish identifying everyone in the photo. 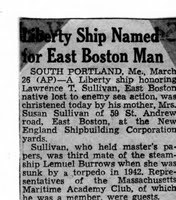 For those curious about the fate of the Liberty ship named after Lawrence T. Sullivan - it was scraped in 1971 - see image below for its history (click to view larger). Hi, my name is Lawrence T. Sullivan and I am Jacky's son. I was given articles and documentation of the Vessel LTS. If you are interested in these please let me know. They are only collecting dust now. I would love to get copies of whatever articles, photos, or any other family history info you may have. Can you email me at jane@deedy.com? I can send you my address. Also, can you confirm that #27 in the group photo is indeed Jacky Sullivan? I had two different sources identify him, but a couple of others were not sure. The hat might be throwing people off.